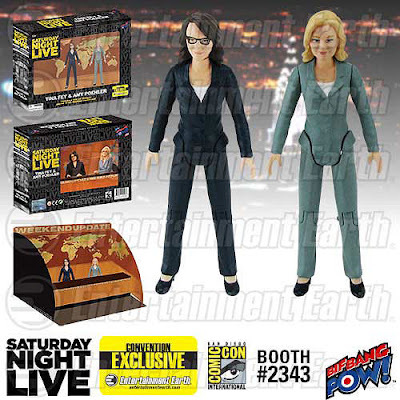 Available for the first time on July 8, 2015 at the Entertainment Earth booth #2343 at San Diego Comic-Con, fans will have the first opportunity to grab the individually numbered and limited edition exclusive "Saturday Night Live" Weekend Update with Amy Poehler and Tina Fey 3 1/2-Inch Action Figures set before it disappears from the headlines for good! This 3 1/2-inch set of figures showcases the leading ladies of laughter in their professional news anchor attire. The two SNL alumni come ready to deliver the news with the included fold-out diorama of the iconic "Weekend Update" news desk. This Entertainment Earth Convention Exclusive is limited to just 2,400 pieces. LOS ANGELES, CA: May 27, 2015 - Why just listen to the news when you get to play with it? That's what Bif Bang Pow! had in mind when they created the Saturday Night Live Weekend Update with Amy Poehler and Tina Fey 3 1/2-Inch Action Figures Set of 2. Showcasing the detailed likenesses of both Tina Fey and Amy Poehler, this 3 1/2-inch set of figures showcases the leading ladies of laughter in their professional news anchor attire. The two SNL alumni come ready to deliver the news with the included fold-out diorama of the iconic "Weekend Update" news desk. This Entertainment Earth Convention Exclusive is limited to just 2,400 pieces. Available for the first time on July 8, 2015 at the Entertainment Earth booth #2343 at San Diego Comic-Con, fans will have the first opportunity to grab this individually numbered and limited edition exclusive set before it disappears from the headlines for good! Not attending San Diego Comic-Con 2015? *PRE-ORDER your Saturday Night Live Weekend Update Amy Poehler / Tina Fey 3 1/2-Inch Action Figures Set of 2 at Entertainment Earth now! Order SNL Weekend Update Amy/Tina 3 1/2-Inch Figure Set of 2-Excl. from Entertainment Earth! 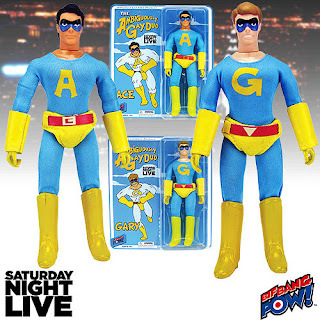 Order Saturday Night Live Ace and Gary 8-Inch Action Figures Set from Entertainment Earth!